Cardiff City manager Russell Slade has admitted the club made a mistake in releasing Wales prospect Regan Poole. Poole, 17, made his debut for Manchester United in their 5-1 Europa League victory over Midtjylland. He joined United in September, after just 17 appearances for Newport County, who signed him when he was released by Cardiff City's academy in 2012. Slade was not in charge when Poole left but said: "You don't want to be losing that type of quality." The former Leyton Orient boss added: "Occasionally one does get away because young players develop at different rates. "But clearly a decision was made at that particular time and they got it wrong." 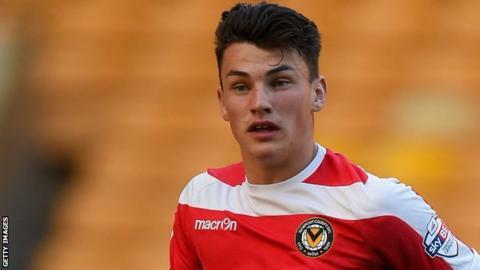 Wales under-17 international Poole joined the youth ranks at Newport and was fast-tracked to a first-team debut against Shrewsbury in September 2014 aged just 16 years and 94 days. Poole joined Manchester United for an undisclosed fee, believed to be an initial £100,000 which could rise to £400,000. "I cannot control what has happened in the past, before my time," said Slade. "But, certainly, if I had been here as manager at the time - obviously the personnel has changed at that level since then as well - you would be wanting to know the reasons why it actually materialised a player in three or four years time has gone and come on as sub for Manchester United." Meanwhile, Cardiff captain David Marshall is in line for his 250th league appearance for the club in Saturday's Championship home game with Preston North End. Owner Vincent Tan recently said the club had turned down £6m for the Scottish international, with West Bromwich Albion and Everton linked. And Slade is expecting more interest in 30-year-old Marshall this summer. "It would not surprise me at all if there were one or two clubs who came seeking his services. He is a top, top keeper," added Slade. "He's in a small group of people - and I think that is a big compliment - who are ultra professional, with a terrific attitude." The Bluebirds have one or two slight injury worries ahead of their clash with in-form Preston and will be looking to recover from Tuesday's 3-1 defeat at Middlesbrough. "It was a setback on Tuesday, it was a difficult, tough game but we made mistakes and got punished for them," said Slade. "We have to learn from them quickly and ensure we get back to a similar performance we had in the last home game against Brighton." Cardiff expect defender Sean Morrison and winger Craig Noone to be available after injury for the Severnside derby against Bristol City on 5 March.